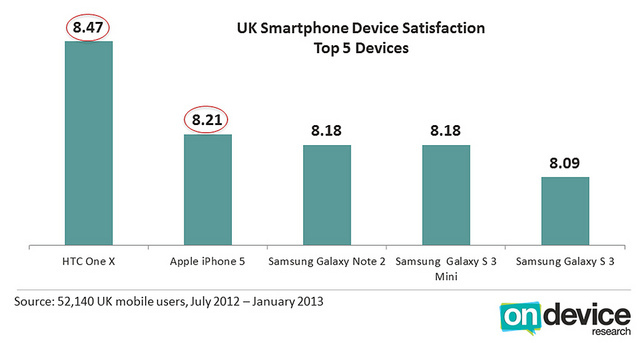 OnDevice show us the top 5 phones for customer satisfaction on both sides of the pond! The set of devices you can see in the picture above were among the top devices a couple of years ago, but since then we've come a long way. 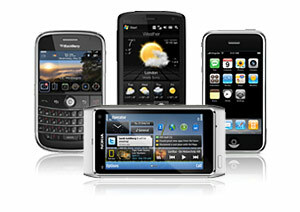 The iPhone got slicker, Nokia chose Windows Phone, RIM are now Blackberry and HTC are struggling to make money now. With the benefit of hindsight it shows just how important customer satisfaction is and the latest set of research from OnDevice shows some very interesting results. The company asked people in both the UK and USA, but we'll begin with the latter, how satisfied they were with their latest piece of gadgetry and the results were quite surprising! 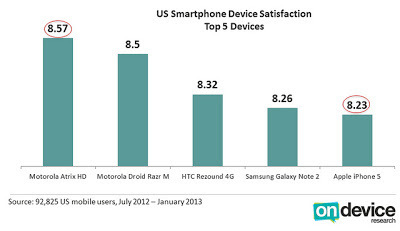 American mobile phone users reported that their Motorola devices gave them high satisfaction rates, with the Atrix HD topping the list, followed by the Droid Razr M, both of which beat out HTC's Rezound 4G, Samsung Galaxy Note 2 and the iPhone 5, which came in a surprisingly low fifth place! In a study of 93,825 US mobile users it's interesting to see the gains that Android has made in usability and it seems Motorola are doing a really good job impressing their customers! Back on the European side of the pond things were a little different. Samsung put in a good showing with their Note 2, Galaxy S3 Mini and Galaxy S3 securing the third, fourth and fifth positions in the device satisfaction chart. Interestingly the HTC One X ran away with the show and the iPhone 5 came in a much more expected second place, narrowly beating the Galaxy Note 2 and Galaxy S3 Mini who were only a fraction behind, in the poll of 52,140 users! OnDevice were keen to point out the apparent impact 4G had on ratings. In America the top 5 devices for satisfaction were all 4G capable devices, and some additional research pointed out that customers who had a 4G subscription, on the whole, reported higher device satisfaction! The UK was seemingly immune to this phenomenon because EE is the only provider and the iPhone 5 was the only 4G capable device, so for the moment that wasn't applicable here. 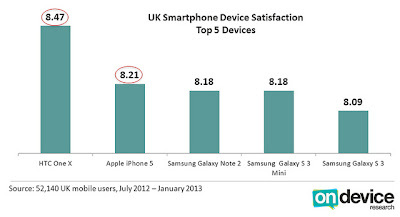 You can check out the full report at the source link below and feel free to sound off in the comments, we'd love to hear why you think the HTC One X was so well regarded by people in the UK!